Ashley Giles took his first five-wicket haul on home soil as England completed a 210-run first Test victory over West Indies at Lord's. Giles ended a fourth-wicket stand of 70 when he bowled Brian Lara for 44, gaining his 100th Test wicket. 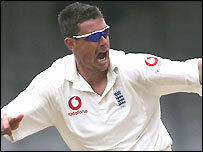 And Geraint Jones completed two stumpings as the tourists were bowled out for 267 before tea on day five. 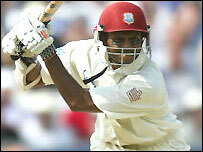 Shivnarine Chanderpaul was the only man to stand firm, an unbeaten 97 taking his match aggregate to 225. Giles' 5-81 marked his first five-wicket innings haul in a winning cause and career-best match figures of 9-210, gaining him the man-of-the-match award. Not since Derek Underwood took 13-71 against Pakistan in 1974 has a spinner taken better match figures in a Lord's Test. The victory was England's seventh in their last eight Tests, with their last defeat against Sri Lanka in December. They could already be pretty certain of celebrating after declaring with their second innings total 325-5 on Sunday. Beginning the day 114-3, Lara and Chanderpaul carried the best hopes of batting out the day. While Lara was in there even remained a faint hope of reaching the record 478 needed for victory and the duo frustrated England for an hour and a quarter. Bowling for all but one over of the morning, over the wicket and into the rough outside the off-stump for the left-hander, Giles caused Chanderpaul more trouble. But Lara provided the milestone wicket, bowled by a ball that beat him with flight and turned sharply. Dwayne Bravo provided the left-armer with a tame return catch and Ridley Jacobs was caught at slip off Hoggard in the very next over. Harmison put a desperate Banks out of his misery by uprooting his stumps. Then Tino Best had a rush of blood to the head after he was on the receiving end of some chatter from the fielders, and was promptly stumped looking to heave. And Giles ended a frustrating ninth-wicket stand of 44 when Pedro Collins fell for two, looking to slog-sweep the 38th delivery he had received. Chanderpaul, who was not given out caught off his glove on nought, survived some terrible blows, on the elbow early from Harmison and the knee from Jones. In all he faced 270 deliveries, with 15 fours, including three in successive balls from Hoggard late in the piece. But for the final three hours it never looked like being enough. Andrew Flintoff's cameo brought the wicket of last man Fidel Edwards to strand Chanderpaul three short of his ton. Only once, in 1973/74, have two batsmen hit two centuries each in the same match, when Australians Ian and Greg Chappell achieved the feat against New Zealand, and it was not to be here. West Indies have not defeated their former whipping boys since the first Test of their last visit in 2000. England: Michael Vaughan (capt), Marcus Trescothick, Andrew Strauss, Robert Key, Graham Thorpe, Andrew Flintoff, Geraint Jones (wkt), Ashley Giles, Simon Jones, Matthew Hoggard, Steve Harmison. West Indies: Brian Lara (capt), Chris Gayle, Devon Smith, Ramnaresh Sarwan, Shivnarine Chanderpaul, Dwayne Bravo, Ridley Jacobs, Omari Banks, Tino Best, Pedro Collins, Fidel Edwards. Umpires: DJ Harper, RE Koertzen.